HCMC, 29 October 2017– Canon Marketing Vietnam this morning kicked-off its inaugural Canon EXPO at Ho Chi Minh City’s Hoa Lu Stadium. The exhibition will showcase the company’s latest technologies from around the world, and is one of the flagship events of the imaging leader’s dual celebration of 15 years in Vietnam and 20 years of partnership with its distributor Le Bao Minh. The four day exhibition will be held between and 29 October at Hoa Lu Stadium, located at 2 Dinh Tien Hoang Street in District 1. 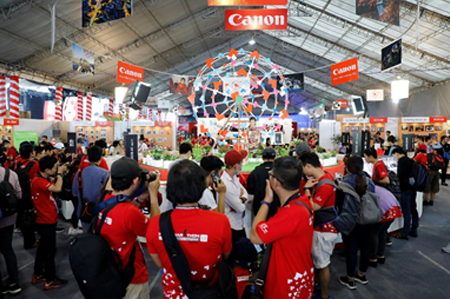 Open between 9 am and 9 pm daily, on show will be Canon’s full suite of new technologies, products and services, set against a backdrop of interactive exhibits, music shows from several Vietnam’s hottest performers and activities for the entire family. Beyond the cameras and lenses upon which Canon initially built its name, the company is focused on the development of its customer service experience and innovating within the imaging space. Canon EXPO 2017 will provide visitors the opportunity to see the company’s professional 4K camcorders, high resolution chip security cameras designed for low-light conditions; and output products including 4K projectors and 12-color-ink printer systems. People will also have the chance to see medical, architecture, security and real estate imaging products on site, and test out 3D printers, ophthalmoscopy and eye refraction products. Canon EXPO 2017 will feature the first Vietnam showing of Canon’s latest developments. These include 3D printers, cinema-grade 4K projectors and 120MP / 250MP CMOS sensors. While Canon is well known for its DSLRs and its compact, fashionable cameras, Canon EXPO will give photographers their first chance to see the world’s highest resolution sensors for themselves. The 120MP and 250 MP sensors are able to create pictures as large as a soccer field. The sensors will be used for such purposes as security cameras in future. The image quality experience is a journey from input to output. Canon EXPO will allow designers, marketers and artists to view stunning creations from Canon’s latest 3D printers. The printers allow users to make their ideas become tangible realities in just seconds. Dubbed ‘MARV’ – from MARVelous – the printers showcase the magic behind imaging technology, and the marvelous feeling that comes with the 3D printing experience. Canon EXPO will highlight the broad reach of Canon’s technology, from the consumer-focused personal and family cameras, to semi-professional and professional grade photographic equipment, to photo printers for preserving memories. The business segment has options for enterprises large and small, including multifunction printers and scanners with their dedicated Therefore and uniFLOW software that enhances the performance of industrial printers, projectors and network cameras. Meanwhile, the one stop solution with multi-functional printer imageRUNNER ADVANCE Gen 3 scales can satisfy the demand of any modern office. Beyond just scanning and saving data via Therefore, it also monitors the workplace printing environment with uniFLOW to manage the safe and secure storage of data. Visitors will see samples printed on glass, iron, wood and stone from Canon’s printers. The company will also have the imagePROGRAF PRO-540 large-format printer. With a red stripe reminiscent of Canon’s camera lenses, the printer features 12-LUCIA PRO colors based on the Chrome Optimizer standard that helps optimize photo colors, along with a new generation FINE print head to help save time and generate high resolution imagery. The two-paper-roll design also provides flexibility in converting print materials. The latest in entertainment technology in Canon’s 4K and interactive projector range. Canon EXPO features a cinema zone, where the company’s entertainment technology will be at the center of a full area of games and movies on a 4K projector screen – the hottest trend in home theater. Few things concern us as much as our own security, and with an eye on the future of security, Canon will launch a high-resolution network camera system with an ultra-wide viewing angle, that can see through the night and capture movement in extreme low light conditions. The new generation of security cameras inherits Canon’s legacy of excellence in lens technology, and with supreme night vision and wide-angles, serve to dramatically decrease the investment into surveillance. On top of these technological-trio, Canon will also have its latest in optical technology on site at Canon EXPO, with its eye-scanning and ophthalmoscopes on display. 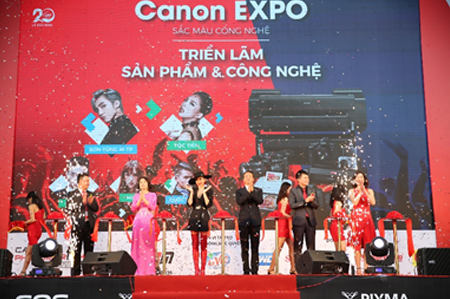 With the stars on show at Canon EXPO, guests will have the opportunities to see daily concerts from Toc Tien, Son Tung M-TP, Min, Soobin Hoang Son, Isaac and Quoc Thien. Creative Park – guests with families and children can print and decorate their photos for free with stickers and a crafty cutting and pasting area to make unique and stylish albums to preserve their memories. Selfie Street – or our Umbrella Art Street, so named for the suspended umbrellas that adorn the area to create cool lighting effects for visitors looking to create priceless Selfies at Canon EXPO. With an entrance that exhibits Vietnamese Heritage works from prominent photographers, Selfie Street also includes the registration area for PhotoMarathon 2017, as well as the music stage, and Le Bao Minh’s area. Cinema zone allows guests to fully experience entertainment including movies and games on Canon’s 4K projector. Additionally, the 4k movies on-show were shot with the Canon C700. Photography workshops will be held throughout the four days, led by top shooters Hai Dong, Hai Thanh, Ho Vu, Nhut Hung, and Minh Hoa. The photographers will share their tips and pointers for using Canon EOS product lines like 800D, 77D, 6D Mark II, M6, M100 and so forth, but also share their experience with composition, lighting and angles. Participants can put the theory into practice right away, with bikini and body paint models there to be photographed. Canon EXPO – A celebration shared with our customers with the best prices on incredible products! With a huge range of amazing deals on offer, discounts of up to 49% will be available to guests at Canon EXPO. Canon will also be offering free inspections and maintenance to Canon cameras and lenses brought in by customers. Some of Canon’s premium range of cameras will see discounts as high as 30% - or between 6 and 14 million VND on such products as the Canon EOS 6D Mark II and 5D Mark IV 2 máy này giá đâu có như vậy - with gift packages worth 3.5 million VND also offered to customers. Giveaways will also include 5,000 luggage tags designed like Canon cameras, 2,000 Miniso vouchers valued at 50,000 VND each and event partners Nguyen Kim and Miniso will be on hand offering further discount coupons to visitors. 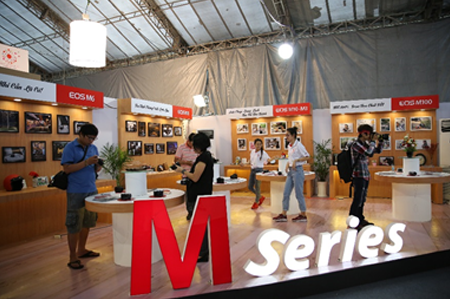 On top of the giveaways, Canon will also be holding lucky draws daily with daily prizes including a Canon EOS camera M100 worth 13.2 million VND, and 2 photo trips each exhibition day. Accompanied with Canon in the big promotion activities for 4 days at Canon EXPO, Nguyen Kim shopping center and Miniso will also offer thousands of attractive discount coupons.